I was able to reproduce a query performance issue that I would describe as unexpected. I'm looking for an answer that's focused on internals. 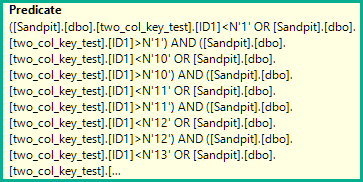 Instead of stopping there, I'd like to understand what that is and why there's such a large difference between the two queries. Why is there a large difference in CPU time for these two queries? A residual predicate is applied to rows that pass the seek conditions above (all rows in your example). ...is counterproductive here. Collation-aware string comparisons are expensive. Doubling the number of comparisons explains most of the difference in CPU time you see. This will also highlight the slight cardinality misestimate on the seek, which explains why the optimizer chose the seek over the scan in the first place (it expected the seeking portion to eliminate some rows). While the inequality rewrite may make (possibly filtered) index matching possible (to make the best use of the seeking ability of b-tree indexes), it would be better to subsequently revert this expansion if both halves end up in the residual. You could suggest this as an improvement on the SQL Server feedback site. 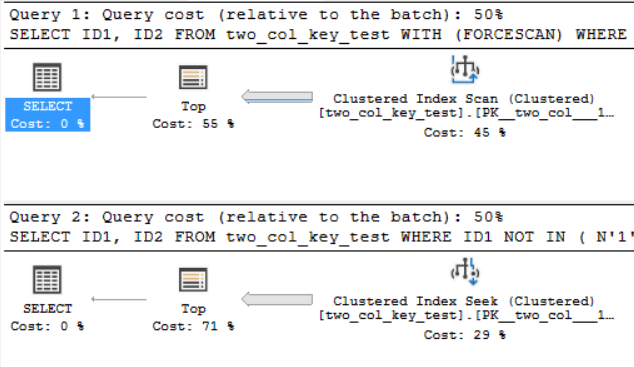 Note also that the original ("legacy") cardinality estimation model happens to select a scan by default for this query. Not the answer you're looking for? Browse other questions tagged sql-server query-performance database-internals or ask your own question. Why is an aggregate query significantly faster with a GROUP BY clause than without one? 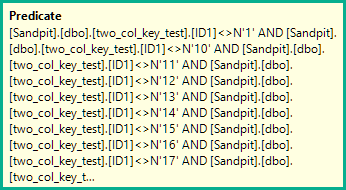 Large time difference between two almost identical simple queries…why?